When watch connoisseurs ponder where the next Abraham-Louis Breguet could be coming from, the most logical candidate is Francois-Paul Journe. The history of his small, very high quality F.P. 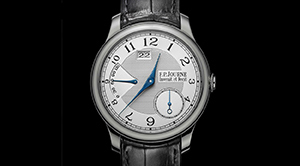 Journe watchmaking concern can be summed up by his Latin motto: "Invenit et Fecit:" He invented it and made it. It is inscribed along with his name on many of his watch dials. 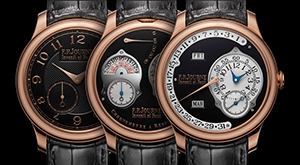 Journe is an international phenomenon. He's as much an avant-garde artist as he is a horologist, approaching his first creations as individual, extremely high-tech sculptures. His talent and knowledge of historical watchmaking as well as contemporary design have produced some remarkable masterpieces that are fabulous, quirky departures from the other largely conventional Swiss watchmakers. But a great watchmaker he is, in the very deepest sense; his small workshop produces in-house components, movements, and complications for high horologic watches one at a time. They're built in the 18th century tradition of exploration and craftsmanship of Journe's hero Abraham-Louis Breguet. 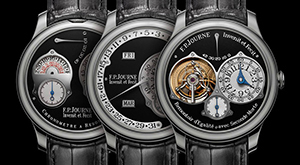 Journe has made an enormous impact on the industry since the company's founding in 1999, winning prestigious awards year after year for his technologically sophisticated and distinctively designed watches. Francois-Paul Journe was born in Marseille on March 22, 1957. He entered the watch making school at 14, accepting his path and profession without ever wavering. Like the lives of many of the earliest Swiss watch making pioneers, Journe's artistic and technological calling came early. In 1976 he graduated from the Ecole d'Horlogerie de Paris with a watchmaker's diploma. 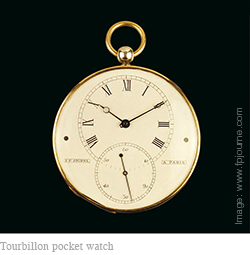 His first project was initiating the creation of his own tourbillon pocket watch, the only way he could afford to have one. Journe learned a step-by-step process from books by the great contemporary watchmaker George Daniels, who displayed the direct link of horology to art rather than just function. Watchmaking and especially The Art of Breguet directed Journe on his own workbench. In 1977, Francois began his eight-year apprenticeship working in his uncle Michael Journe's antique watch restoration and conservation workshop in Paris, which ultimately led to a partnership. He learned his trade working on high-grade, nineteenth-century watches, and in 1979, at the age of 22, Francois-Paul was commissioned by the Ateliers P-G Brun in Paris, to design a planetarium mechanism for Asprey in London. It was made of white and yellow gold, rubies, and diamonds, with 12 lapis-lazuli sides ornamented with the signs of the zodiac. The planets of the solar system revolved around the sun on a synchronized pendulum that supported and powered a complex wheel train. In 1982, after five years of work, Journe finished his first gold and silver tourbillon chronometer pocket watch, as well as an extremely complicated skeleton perpetual clock. Journe began taking commissions full time in 1985, establishing his first workshop in Paris on the rude de Verneuil when his uncle retired. In 1986 Journe produced an automatic chronometer pocket-watch with fusee and chain that housed a five-second remontoir, a detent escapement, and a rock crystal dial displaying a retrograde perpetual calendar mechanism with the equation of time. 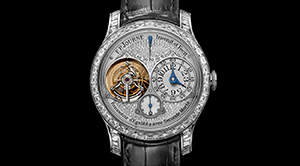 This was Journe's homage to Abraham-Louis Breguet's watch creation for Marie-Antoinette. In 1987 Journe created a planetary pocket-watch, his sixth timepiece, commissioned by a scientific objects collector; he also received a prize and became a laureate of the Fondation de la Vocation Bleustein-Blanchet, which is only awarded to thirty artisans each year. In 1988 he made three examples of his "pendule Sympathique" clock for Asprey's of London. Abraham-Louis Breguet, who invented the first Sympathique, again inspired Journe, although Journe's was a more complex design enhanced with an exquisite modern movement. 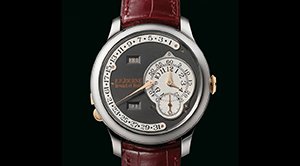 In 1989 Journe won the Balancier d'Or prize at the Madrid watchmaker's convention. 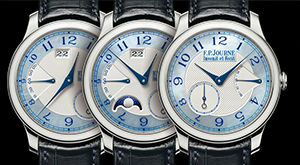 In 1992 Journe created his first wristwatch using the novel remontoir system he invented in 1982 for a pocket-watch. 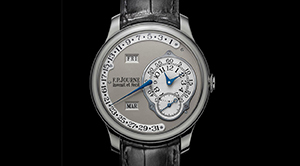 The remontoire is a second, small source of power from a weight or spring that runs the caliber mechanism, which is rewound by the mainspring. This became the prototype for his "Tourbillon Souverain," with the gear trains and movement components crafted out of 18K gold. 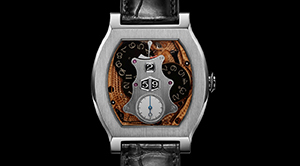 The Musee de l'Homme et du Temps honored Journe with the Gaia Watchmaker of the Year award in 1994, and in Geneva in 1996, Journe formed TIM SA, an organization designed to develop unique calibers in what he called "Haute Horologie." 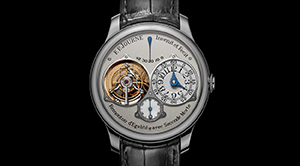 To wind up the century and the millennium, in 1999 the Tourbillon Sourverain and a collection of chronometers â Invenit et Fecit (created and made) â were launched with the F.P. Journe label at the AHCI booth in the Basel Show, meeting tremendous success and acclaim. 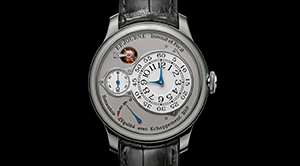 Invenit et Fecit became the official motto for Journe's company. 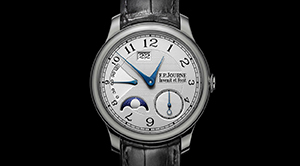 To celebrate the new millennium, Journe debuted the "Sonnerie Souveraine," to the marketplace at the Basel show in his own booth under the company name, Montres F.P. Journe in 2000. The Sonnerie was an innovative, complex design with a retrograde minute display and a section of the dial that revealed part of the mechanism. He also debuted the first resonance wristwatch that became the "Chronometre a Resonance." This allowed the balance wheel in the movement to vibrate at a much higher frequency. Also in 2000, the workshops of F.P. Journe were established in the center of Geneva's Plainpalais artist district. The little manufacture now hand built 3 to 4 watches per day, or about 900 per year. In 2001, Francois-Paul's son, Maxime, was born, as was the first automatic movement caliber from the Octa collection that guaranteed five days of precision timekeeping when unworn. The large, 120-hour power reserve promised to support new complications in the future. 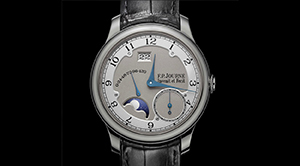 In addition, FP Journe began an association with Harry Winston Jewelers, designing eighteen exceptional, unique watches called the Opus One collection. In 2002, Francois-Paul started the Montres Journe SA antique clock collection by acquiring the resonance regulator made by French horologic genius Antide Janvier in 1780. This clock actually inspired Journe's ChronomÃ¨tre Ã rÃ©sonance, and was one of the world's first timepieces experimenting with high frequency resonance. The first private exhibition for supreme retailers was held at the Montres Journe headquarters in Geneva, with tours of the workshops on the first floor. 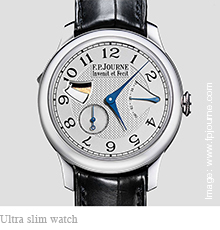 Of the fifty companies with the ability to sell Journe's watches, he was now represented by 34, finding it unnecessary to exhibit with other watchmakers. 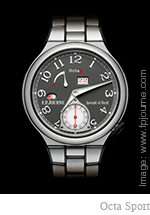 Journe also received the special jury award of the "Grand Prix d'Horlogerie de Geneve" for the Octa Calendrier watch. 2003 saw the opening of the first showroom boutique in Tokyo â the Montres Journe Japon KK â in the Collezione building of the Omotesando district near the Nezu Museum. In a building designed by renowned architect, Tadao Ando, it included a watchmaking library, a lounge, and a bar where watch aficionados gathered to discuss their favorite subject or purchase one of a few hundred chronometers produced for Japan every year. Francois-Paul Journe contributed to his own two-floor store by designing the railings, overhead passage, and the interior staircase. Also in 2003, the automatic winding Octa Lune, with its five-day power reserve, received the Grand Prix d'Horlogerie de Geneve for Best men's watch. 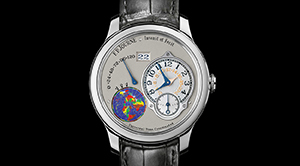 To Journe's delight, the ChronomÃ¨tre Ã rÃ©sonance also won the Watch of the Year Jury Award in Japan. 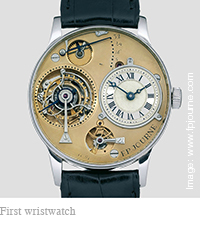 Once again at the Grand Prix d'Horlogerie de Geneve in 2004, Journe was honored with the ultimate, coveted award, "L'Aiguille d'Or," the Golden Hand, for his Tourbillon Souverain, which was also presented the Watch of the Year grand prize in Japan. 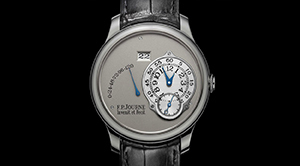 At the 2005 Grand Prix d'Horlogerie de Geneve, the Chronometer Souverain won the Favorite Men's Watch award. That same year, Montres Journe began producing all their movement components in house out of 18K red gold. In 2006, the French Minister of Culture bestowed upon Francois-Paul Journe the title of the "Chevalier des Arts et des Lettres." 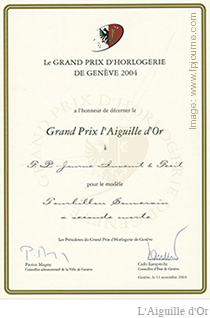 He also won his second "Aiguille d'Oro (Golden Hand) ultimate award for hisSonnerie Souveraine. The showroom boutique in the historical center of Hong Kong opened on October 3rd in the Princess Building. 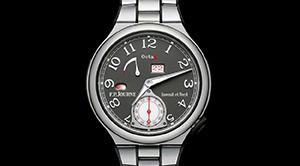 Moreover, in Tokyo the Watch of the Year award also went to the Sonnerie Souveraine. In 2007 the new showroom boutique opened on Place Longemalle in the center of Geneva on April 17th; on December 4thanother exquisite store opened in Boca Raton, Florida. The new Exhibition Space of the Manufacture held the Exhibition Steel Time from October 15th to December 21st. In 2008 the ultra slim, and many claim breathtaking minute repeater, debuted at the annual salon in the Exhibition room from April 7 to 12. In Los Relojes Del Ano 2008, theRepetition Minute Souveraine â equally breathtaking â was named the Watch of the Year in the Grand Complication category. 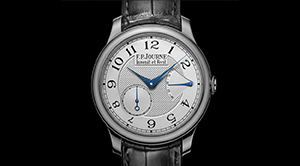 Journe again received the "Aiguille d'Or" at the Geneva Watchmaking Grand Prix for the Centigraphe Souverain, and the boutique opened in Paris in December with the customary little sign, F.P. Journe - Invenit et Fecit. In 2009 the slim Minute Repeater won the "Best Technique Innovation Watch" at the Champions of Time competition in China. 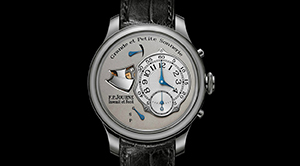 The Centigraphe Souverain was awarded the "Watch of the Year" for 2008 on Timezone.com. Elegant F.P. 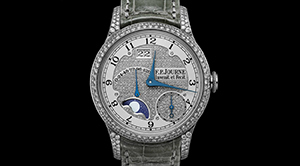 Journe boutiques debuted in New York and Pekin in November. F.P. 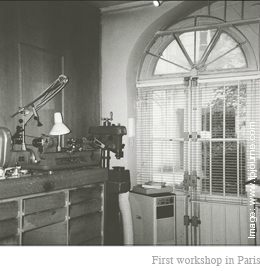 Journe was now a world renowned watchmaker and retailer. 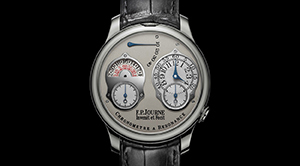 In 2010, revisiting The Champions of Time in China, Journe once again was given the "Best Technical Innovation" award for his complicated Vagabondage II. For an unprecedented seventh time, the Grand Prix d'Horlogerie de Geneve gave him the Grand Complication Prize for the incredibleChronomÃ¨tre Ã rÃ©sonance. 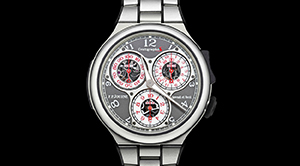 The Octa UTC was presented at the January 2011 exhibition at the Manufacture, and Francois-Paul held a world premier for his entirely aluminum (mechanism, case, and bracelet) Centigraphe Sport, the first watch of his newLinesport collection. Number 001 sold at Christie's for ten times its original price, with the proceeds going to the victims of the Japanese earthquake and tsunami. The Espace F.P. Journe boutique opened in Buenos Aires, Argentina on December 5th with their partner, Simonetta Orsini. The great, historical steel time exhibit was held at the Forbes Galleries in New York from April 15th to September 15th, 2012. This included F.P. Journe's collection of 250 burnished steel watches produced between 1850 and 1910. The all aluminum Octa Sport debuted, the second offering from the Linesport models. F.P. 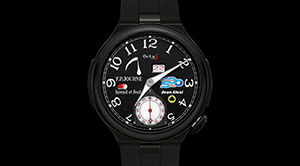 Journe entered a partnership with Jean Alesi and Lotus to compete in the Indianapolis 500 on May 27th, and in homage to the driver Alesi, brought out an Indy 500 edition of 99 examples. 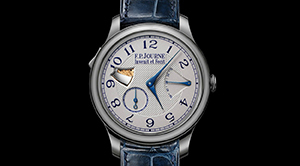 TheChronometre Optimum was presented in the international Journe boutiques. In 2013, at the annual exhibition in January, the new Quantieme Perpetuel was launched, and for popular culture exposure, an F.P. Journe watch appeared on the wrist of Academy Award winner Jean Dujardin in the new film Mobius. Reference CB. An elegant, playful, and stunningly blue timepiece with central hours and minutes, offset small seconds dial, and matching blue leather bracelet. Made of the special alloy tantalum. Reference CS. In four styles of platinum or red gold with matching metal bracelets or leather bands, with hours, central minutes, a small seconds dial, and a power reserve. Reference CT. In four combinations of platinum or red gold, with hours, central minutes, 1-second register at 10 oâclock, 20-second register at 2 oâclock, 10-minute register at 6 oâclock and power reserve of 24 hours with chronograph and 100 hours without. Reference RT. This is produced in red gold or platinum, with matching metal bracelet or leather band. The functions are beautifully integrated into four separate sub-dials, including a double time display with a 24-hour digital dial on the left, and a 12-hour analog dial on the right, hours, minutes, and small seconds. Reference TN. This tourbillon has hours, off-centered minute display, small second dial, and power reserve. Reference RM. This fantastic steel watch has hours, central minutes, small seconds dial, power reserve, and a minute repeater. 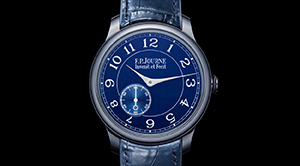 The dial is silver guilloche with distinctive indigo blue hands and numerals, and a blue leather bracelet. Reference GS. This is a beautifully complicated steel masterwork with hours, off-centered minutes, a small seconds sub-dial, power reserve and grande and petite sonnerie. It comes with a leather bracelet. Reference CO. This watch is produced in platinum or red gold, with a 1 second remontoire at 11 oâclock, a natural dead-beat second on the open back of the movement, off center hours and minutes, a small seconds dial, and a power reserve. Reference UTC. Debuted in 2011 with off-center hours, minutes, and time zones, earth dial, small seconds, winter/summer hour, large date, and power reserve. Reference A. Offers hours, off-centered minutes, subsidiary seconds, double date and power reserve display. Reference AR. In four combinations of platinum and red gold with central hours and minutes, small second dial, large date window, and power reserve. Reference AL. Red gold or platinum with leather or matching bracelet, with central hours and minutes, small second dial, large date window, power reserve an moon phase. 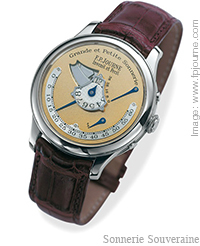 Reference L. In four variations of Platinum or red gold, with large date, off-centered minutes, hour, small seconds, power reserve and moon phase. Reference D. In four combinations of Platinum or red gold with central minutes and hours, large date, small seconds dial, power reserve and moon phase. Reference Q. In four styles of Platinum or red gold, with hours and off-centered minutes, month and day windows, retrograde central date by hand. Reference D. This is a spectacular watch; the platinum or red gold case is set with 184 brilliant-cut diamonds on a leather strap, with hours, central minutes, a small seconds dial, a large date window, power reserve indicator, and a moon phase. The watches with matching metal bracelets have 950 to 1381 diamonds. Reference TJ. This elaborately encrusted case in platinum or red gold is set with 93 baguette diamonds, while the dial has 201 brilliant diamonds. The platinum or red gold bracelets have an additional 425 baguette diamonds, with a double deployant clasp thatâs also diamond set. The watch itself has hours, off-centered minutes, a small seconds dial, and a power reserve. 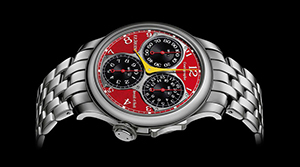 Produced in an edition of only 68 examples in platinum, and 68 in red gold, with crocodile leather straps. This is the first F.P. Journe watch that isnât round, but a lovely rectangular Tonneau-shaped case. It has a 1-minute constant force device with digital hour and minute indicators, a sub-seconds dial, and a power reserve. This titanium watch has a perpetual calendar and a retrograde date display curving around 2/3 of the dial. Day and month windows include a nearly hidden leap year indicator. There is a subsidiary seconds dial and offset hours and minutes. Titanium makes for an extremely lightweight case, but the weight remains due to the solid gold movement components. This brilliant adventurerâs timepiece is entirely made of scratch resistant, anti-corrosive, anti-allergic aluminum â the movement, the case, everything. It only weighs 53 grams. It has central hour and minute hands, a big date window, a small seconds sub-dial, a power reserve, and a day/night indicator. It has rubber âbumpersâ on the sides of the case, rubber-protected links if you choose the matching metal bracelet, and if you prefer the rubber strap, the crown and folding clasp also have rubber coatings. These are offered in red gold with a black lacquered dial in many complication variations. These have a distinctive black lacquered dial and a platinum case, this styling is available for every F.P. 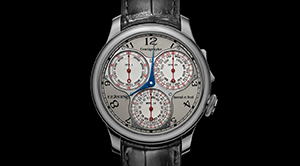 Journe model except the Grande Sonnerie. These come in several combinations of complications in platinum or red gold with luminescent blue or pink Mother of Pearl dials. An exquisite combination of the auto sports and haute horology, this limited edition platinum chronometer and matching bracelet has an exclusive red chrome dial, Ferrari fly yellow hands, and three blackened gold registers. These are the first two of a new line of lightweight, durable watches for active sports enthusiasts. Like the Octa Sport, the case, bracelet, and movement are created out of an aluminum alloy. It has a separate chronograph train driven by the mainspring, and central hours and minutes. Discussed above in Limited Series. F.P. Journe is the watchmaker that all the other watchmakers are watching. These very well may be the treasured timepieces of the twenty-first century and beyond.